Product reviews: Mabel's Labels "for the stuff kids lose"
Label your life and gear -- end the madness! Kids lose stuff. A regrettable fact, but true. When you live in a small town and everyone shops at Wal-Mart, everyone owns the same stuff. 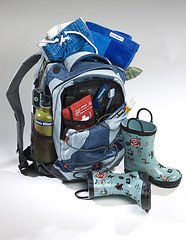 This can make the lost and found pile at school difficult to traverse. I used to rely on the tried and true permanent marker method. I scrawled my kids' names on everything I could… but somehow the the permanent in front of marker didn't always hold true. Besides, it looked tacky! Sew-in labels take forever, and I'm the queen of procrastination. So when I found Mabel's Labels, it was like they were made just for me! As a matter of fact, they were - all of Mabel's Labels come with free personalization. Mabel's Labels come in a variety of shapes, sizes, styles and materials so everything my kids own is clearly marked. The iron-on labels stay on, even after dozens of washings. The Tag-Mates are even better for a lazy mom like me - you just peel and stick it to the clothing tag. I didn't think these would stay on after a round in our crammed washing machine, but so far, so good! There are labels for everything you might take anywhere - cups, cookware, beach towels and sleeping bags. Mabel's Labels even carries sturdy metal 'Bag-Tags' for sports equipment bags, luggage and overnight kits. Camp equipment can be tossed in with everyone else's and easily retrieved later. The one tag that really got me was the Shoe Label. Remember, I said small town - I mean small. If I think every fifth kid has the same coat mine does, every other one has the same pair of sneakers. Permanent marker just isn't when matched up against the relentless friction of little feet. The Shoe Label is a stick on tag that won't come off, wear off or even fade - it has a water resistant coating for sweaty days or rainy ones when they jump in puddles. Just slap one in the insole of each shoe, and nobody can miss it. I have to put in a word for the wristbands, too. I used to write my cell phone number on my kid's arm in indelible ink when I dropped them off for field trips, day camp or VBS. You think I'm kidding? I invented paranoia. Now my littlest can sport a tricked-out wristband with his name and my number on it, and I can be confident whoever's in charge knows how to reach me! I actually plan to give a friend of mine some of the special 'Allergy Alert' labels and wristbands for Christmas - her little boy has severe allergies, including peanuts and bee stings, so she is constantly having to write and stick notes on everything. These labels will make her life 100% easier! Mabel's Labels - for the stuff kids lose, and so much more. Why is winter so long? Our little camper -- a nearly 30-year-old, 19-foot restored Shasta -- sits in the yard beside our garage. She's sinking into the soggy sod right now, after spending the bitter months shrugging off the wind and snow, mostly unscathed. We've had a few days with temperatures in the low sixties recently; makes me glance longingly at our old trailer, hoping for warm nights and 9 pm sunsets soon. I no longer love winter. It's too long. We're just far enough north here, near Lake Ontario, that the cold and gray months encroach on the end of fall and the first half of spring. We joke that spring is about two weeks long. Our "leaf season" is longer than that, but prone to early snowstorms. I used to love winter -- when I was young and single and could afford to go skiing. Now I spend the weeks following Thanksgiving waiting for summer. It's a long wait, punctuated by the six weeks of Christmas and a couple of oddly-scheduled school vacations. Once Santa has finished flying there's that long no-real-holidays time. Who celebrates Groundhog Day? It often snows on our St. Patrick's Day parade. I hate driving in the snow anymore. We used to brave blizzards to go skiing; now that I'm older I can't see through the flakes as well. I'm approaching a million lifetime miles of driving, with about a third of them in snowy conditions. I've paid my dues, haven't I? Someday I may actually have to consider "flying south." What a terrible thought. The only consolation to New York's seemingly interminable winters is that they force you to appreciate summer. You hear that from people who simply refuse to move to warmer climates: "I'd miss the seasons, and get sick and tired of warm sun." While that's probably true, it's probably also a fairly lame rationalization. While I'm not sure I could stomach the air-conditioned lifestyle of Floridians, I'll bet I could make do in Honolulu. My home, however, is here in upstate NY. Most of my friends and almost all of my family are all here. Moving is expensive, emotionally demanding, and ultimately life-altering. I'll stay here, as long as the bank doesn't reclaim our house. 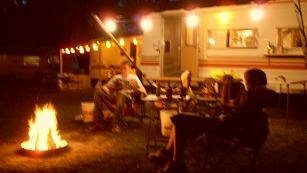 In that event, we'd have to live in our little camping trailer. That would probably take most of the fun out of camping. The summers here are too short, though. That's just a fact. When you balance "perfect camping nights " against "gloomy winter days" the scale always hits the table hard on the "gloomy" side. It's not uncommon for us to suffer through a solid week of sunless days between October and April. I honestly believe that people have "solar batteries" that need to be recharged regularly. I do, anyway. For me, the beginning of NASCAR racing season signals that summer is almost here, somewhere -- Daytona, at least. All the early races are in winter-warm states at first, so we see "summer" long before it arrives in NY. Then the Masters teases us with gorgeous verdant fairways and brilliant azalea blossoms. It's hard for me to watch, when we still have bare trees and brown lawns. Then suddenly, after a couple of "fooled ya" days above seventy degrees, it's summer in New York. The willows burst into pale green abundance first, with the hardwoods last to follow. Before we know it, the days are fourteen hours of sunshine and we're complaining about the heat. We think about buying air conditioners, knowing we won't need them for long. Our lawns need mowing twice a week. We launch some fireworks, grill some hot dogs, take impulsive trips to nearby campgrounds , leave the TV off, and stay up 'til midnight because it's too nice out to go to sleep. We spend two weeks watering our browning lawns, worrying needlessly. And then, quietly and with little warning, our local NFL franchise team arrives for training camp at St. John Fisher College. You know what NFL means, don't you? -- "Fall." Just like that, our summer is nearly done. We savor the final few days in the eighties, or maybe even above ninety degrees, while the merchants scream "back to school!" 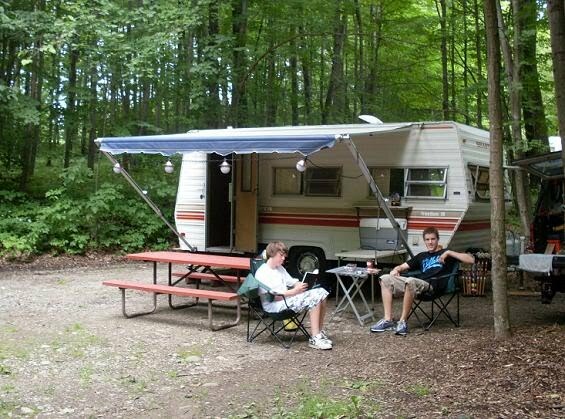 My wife and I frantically try to decide how we'll spend the Labor Day weekend -- camper or no camper ? Home or away? Then the school buses return for their endless trips up and down our hill (the high school is just down the road), and we know it's over. Another summer is gone, the fleeting weekends already fading memories. We begin to watch TV shows again in the evening. We check our tires to make sure we have good "snow tread" left, and gas up the snow-blower. We park the camper in the side yard, and drain off the water lines. I think about writing an article for Helium titled, "Tips for storing your RV camper for the winter." There's that word again: winter. Where did the summer go? How about you? Do you have an opinion about camping and weather you'd like to share? If you'd like to submit your thoughts for posting, you can reach me via Comments or by using the link at the top of this page.